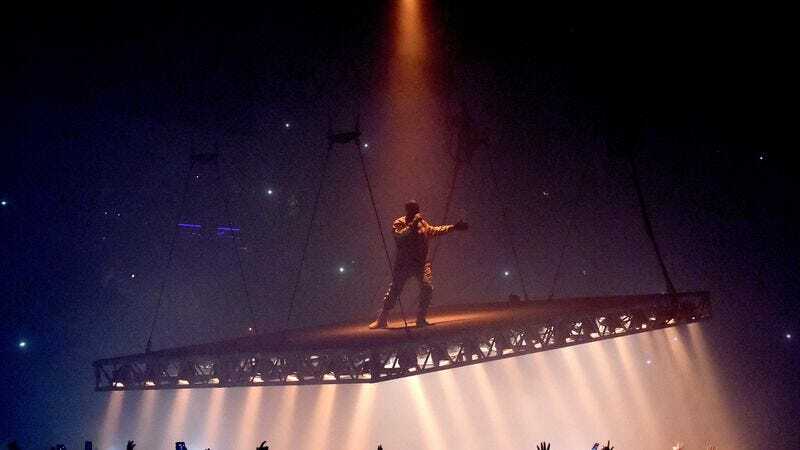 Following the career of a Kanye West is a constant up-and-down, one that alternates between tiring, frustrating, and occasionally legitimately worrying public incidents, and the artistic and commercial achievements that make keeping tabs on him worthwhile. You can add another entry to the latter pile today, with Pitchfork reporting that West’s The Life Of Pablo is the first streaming-only album to achieve platinum status. That’s per the RIAA, the body that governs the sales status for records. Platinum traditionally means the album has sold a million records; for streaming-only works like Pablo—which debuted on Tidal, and continues to be available only via digital platforms—it takes 1,500 streams to equal one “sale.” Pablo just passed that 1.5 billion stream mark in the U.S. (and more than 3 billion worldwide) a fact that will presumably make him that much more insufferable the next time he’s in one of his “floating above a concert crowd, bragging about his fashion line” kind of moods.